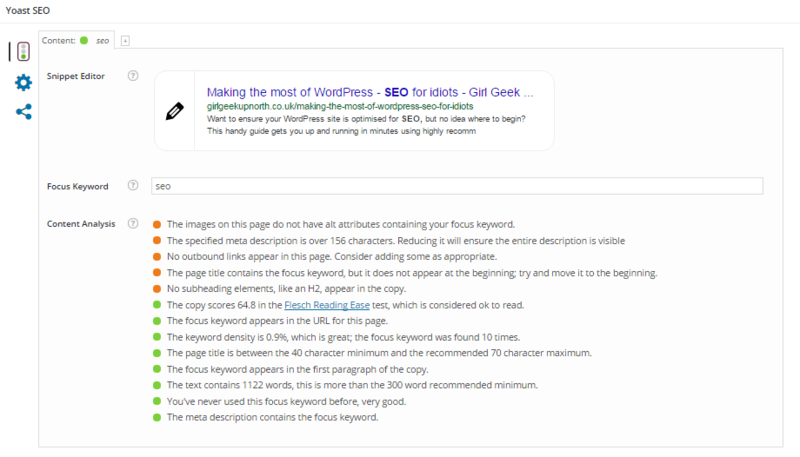 After you’ve prepared your post, you can scroll down into the settings boxes and you’ll now find a Yoast SEO box. Here you can see a preview of how your post will appear in a search engine result, based on the settings you originally inputted. If you’re not happy with the way it looks, then you can make individual edits to the post right there. We can also ensure our descriptions are optimised in the same box. The meta description is the line underneath the url in black, and is usually only displayed by search engines when it contains the search term the user was looking for. As standard, WordPress will use the first sentence for the meta description, but this isn’t a good idea, as it could just be an introductory sentence, and not contain those important keywords. The only way to get around this is to type a manual description. As best practice, you should already be using excerpts on all posts, and this is the content I usually duplicate across to the meta description, as it better encapsulates the content of the post, and you can ensure your keywords are included. Lastly, you need to enter your post’s keyword. Once you have done this, Yoast will score you on a number of key areas using a traffic light system. Green means you’re fine, orange means you have a little work to do, and red means you’re not doing something that you should be, if you want your post to be optimised for SEO. The great thing about Yoast is, that it doesn’t just tell you where you’re falling short, but it then tells you how to fix the problem. Once all your lights have gone green, your post should be good to go! Probably the most important piece of advice we can give, is to create quality content! There’s no point driving traffic to your site if once a visitor arrives, they have no reason to stay….. In addition to using the Yoast SEO plugin for WordPress, you might also want to use Google Search Console, another free service which helps you monitor and maintain your site’s presence in Google search results.